Why Use A Dog To Sniff Out Bed Bugs? It might seem unconventional to use a dog to sniff out bed bugs, but using a dog is much more reliable than any other option that one might look for when faced with the possibility of having your home infested with bed bugs. 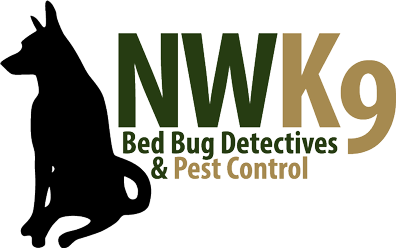 Our bed bug prevention company, Northwest K9, will detect each and every bed bug. We are a superb bed bug detector that uses our dog, Magic, to catch the bugs. We train Magic to effectively seek out where all the bed bugs are so that the problem can be eliminated. Dogs have much stronger senses than humans do, so it would make sense that Magic is able to detect bed bugs much easier than we are capable of doing. Humans have a much lower rate of finding all of the bed bugs than Magic, as shown by our documentation. According to our careful documentation, “our dog averages an accuracy rate of 97 percent… but humans have been shown to have accuracy rates of 30 percent.” Dogs are able to see and detect bugs that our human eyes are unable to see. Other extermination companies use chemicals that are harmful to our health and our pets, and their processes are much more time-consuming than ours. A treatment plan needs to be drawn up to access the infestation, and science and tools are used to exterminate the bed bugs – it can take a while to find all of them. Using a dog to accurately detect and sniff out all of the bed bugs is a much more reliable way to catch bugs. It’s similar to why people take dogs hunting with them. Northwest K9 is a reliable bed bug detector who can catch all of the bed bugs. We are a bed bug prevention agency that will accurately use our K9 to sniff out those buggers. If you’re interested in learning more, please call us at (206) 801-3522, or if you want to find out more facts about Magic, visit our K9 Inspection FAQs. We look forward to giving you a bed bug-free home!